Nags Head is the southernmost of the three largest towns that occupy the northern Outer Banks. The town limits begin at MP10, or ten miles south of the Wright Memorial Bridge. The town is divided into two very distinct districts: Nags Head and South Nags Head. The dividing line can be described as running from Whalebone Junction – where US 64 ends and US 158 begins – to Jennette’s Pier. Most of the residential area is on the west side of the Bypass bordering the Roanoke Sound. The commercial district lines the Beach Road and Bypass. 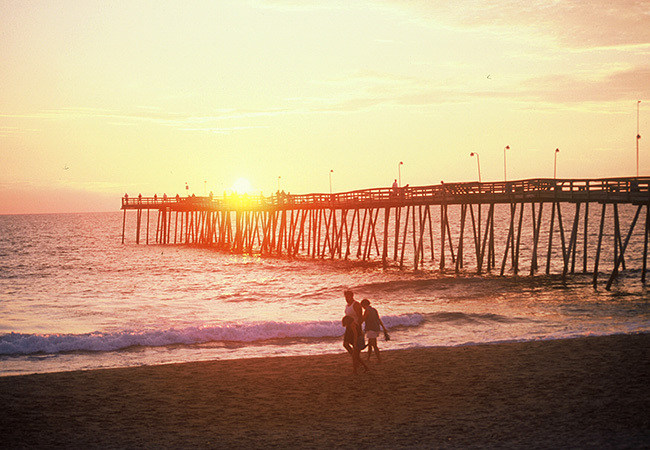 The Outer Banks Pier and a few hotels are the only commercial properties in South Nags Head. Since the 1830s, Nags Head has been a tourist destination. One of the first towns in the United States that had a tourism based economy, the beach, the ocean and the summer breeze are still much of the reason for the town’s continuing popularity. The beachfront development of the town began in 1855 when Dr. W.G. Pool, an Elizabeth City physician, purchased 50 acres of ocean front land for $30,. He built his cottage then sold lots for $1.00 apiece to friends and neighbors so his family would not be vacationing alone. Elizabeth City builder, S.J. Twine came to Nags Head at the turn of the 20th century and his designs are what is now considered the classic Nags Head cottage style. Porches wrap around to the east and south taking advantage of the summer winds and the cool ocean breeze. His peaked roofs were designed so that a strong wind will force the roof onto the frame. Finally, he designed his homes to be lifted off their pilings and moved as the ocean encroached. Twine favored native woods, and his houses were built of cedar and juniper creating a look that Jonathon Daniels, editor of the Raleigh News and Observer, described as “the unpainted aristocracy” in the 1920s. Very few of the original buildings are left. The ones that remain are part of the Nags Head Beach Road Historic District that extends from Soundside Road to Danube Street. At 11 miles, Nags Head has more beach than any other town on the Outer Banks. To date it is the only town that has used beach nourishment, and the results have been excellent. After beach nourishment, sandbars formed around Jennette’s Pier creating ideal surfing conditions. There are numerous CAMA parking facilities adjacent to the beach with many of the parking lots featuring showers and a few with restroom facilities. Nags Head includes a National Park beach at Coquina Beach, which is just south of the end of Old Oregon Inlet Road. Depending on wind conditions, Jockey’s Ridge is either the largest or second largest sand dune on the East Coast. Home to the Kitty Hawk Kites hang gliding school, it is considered one of the finest places in the world to fly a kite. The dune is barren with nothing to block the view which is a breathtaking panorama of the sound and sea. There are three fishing piers in Nags Head. Going from north to south they are: Nags Head Pier, Jennette’s Pier and the Outer Banks Fishing Pier. Nags Head Fishing Pier is at MP 11.5 on the Beach Road. A traditional wooden pier, it has a recently renovated restaurant, and a tackle store. In South Nags Head, the Outer Banks Fishing Pier is at MP 18.5 on Old Oregon Inlet Road. Almost 50 years old, it extends 600’ into the surf zone giving anglers a great chance to hook some of the larger fish running a little farther offshore. Jennette’s Pier is the most spectacular pier on the Outer Banks. When Hurricane Isabel destroyed the original Jennette’s Pier, The NC Aquarium Society bought the property and created a 1000’ concrete pier that includes a small aquarium and fully stocked gift shop. The Pier offers of classes and a wide variety of public information forums. Located at MP 16.5 on the Beach Road, the pier is at the intersection of Old Oregon Inlet Road and the Beach Road (NC12). Nags Head Links parallels the Roanoke Sound. Featuring beautiful vistas of the Atlantic Ocean and Roanoke Sound, the links style par 71 course changes dramatically with the wind. Finesse and low drives seem to do best here. Nags Head has some different shopping opportunities. Major stores are located along the Bypass, family businesses on the Beach Road. Glenn Eure’s Ghost Fleet Gallery (210 E. Driftwood) – A wooden quonset hut shaped building, the gallery features the artwork of Glenn Eure and at least one and sometimes more artists. A visit with Glenn is worth the price of admission – which is free. Jewelry by Gail (Driftwood Street, across from Ghost Fleet Gallery) Recognized nationally and internationally for her artistry, the the showroom is a fascinating look at Gail’s creations. Sea Green Gallery (Beach Road at MP 11) – “The fine art of reuse.” Owner Susan Evans has created a new look and a new purpose for even the most ordinary of items. Seaside Art Gallery is just down the road from Sea Green. One of the original galleries in Nags Head, it has an eclectic blend of art. Expect to spend some time wandering through the rooms. Home to the original Kitty Hawk Kites Store and Kitty Hawk Surf Company (was Kitty Hawk Sports), Jockey’s Ridge Crossing is a shopping experience reminiscent of a time when the only stores in an Outer Banks mall were locally owned. A two story wooden structure across from Jockey’s Ridge State Park, in addition to the kite and surf stores, there is a sandwich/ice cream shop, a fudge shop and other stores. Bargain hunter take note. Tanger Outlet Mall at MP 16 on the Bypass is an overstock and outlet mall for a number of national retailers including The Gap, Eddie Bauer, Ralph Lauren and more. When Nags Head completed its beach nourishment project in 2011, it was the largest municipal project ever undertaken. In reviewing the deteriorating state of the beach, the town council felt they had to take on the project and were not willing to navigate the complexities and uncertainty of federal grants. Beach nourishment is an ongoing process and replenishment will be part of future plans. The town created two Municipal Service Districts to help pay for the project. Get All The Latest Outer Banks Real Estate News & Tips!